By 2.1871 (Passenger train calls shown in working timetable), but probably earlier unadvertised use. First in Bradshaw 1.1875. 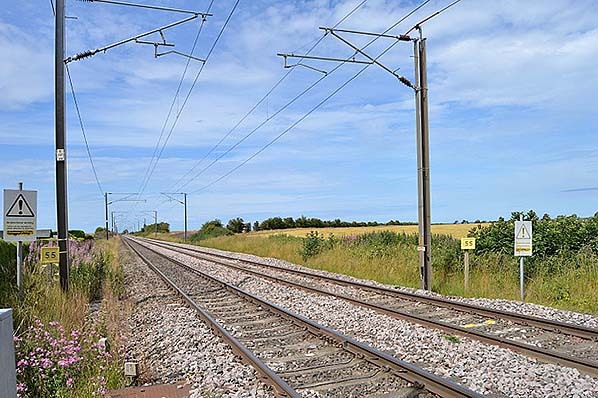 East Coast main line - immediately north-west of the level crossing on an unnamed lane, 500yd east of A1 road. Platforms demolished. Station house is in residential use. 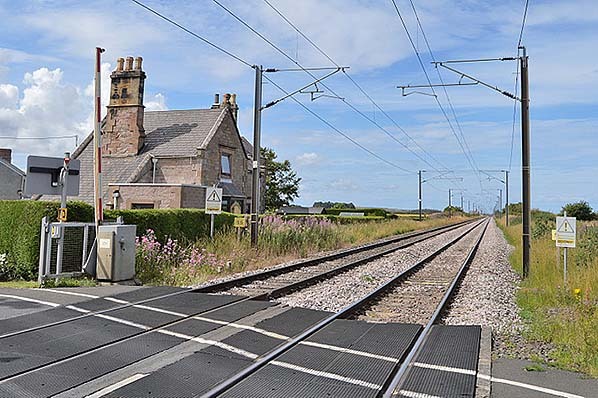 Notes: Standing on the East Coast main line between Belford and Beal were two minor stations – Crag Mill and Smeafield - with histories which are far from straightforward. Smeafield consists only of a farmstead, and there is no appreciable population centre in the locality which would seem to justify the provision of a station. 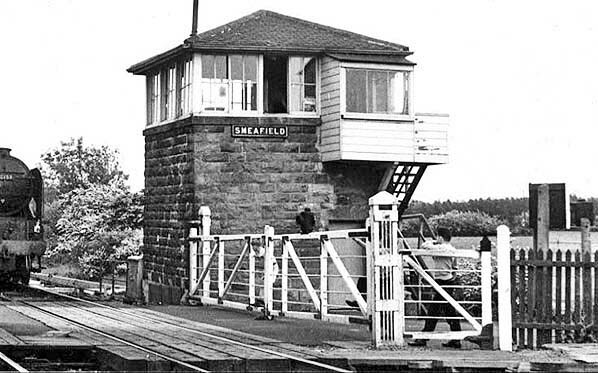 When the contracts were let by the Newcastle & Berwick Railway, Smeafield was in the category of receiving a gatekeeper’s or platelayer’s cottage, and it was located at a level crossing about 400yd north of the farm on a lane between the Great North Road (now A1) and the hamlet of Elwick. Although identified as Smeafield in the contract, the Ordnance Survey map of 1865 (by which time the line was operated by the North Eastern Railway) shows the location as Elwick Gate. The ‘Gate’ suffix was common to identify gated level crossings in NER territory, particularly in Yorkshire, and a good number of these were eventually chosen as sites of stations, where ‘Gate’ was sometimes retained in the station name (as at Menthorpe Gate, Husthwaite Gate and West Rounton Gates). In due course Elwick Gate did become a public station, but the name Smeafield (without ‘Gate’) was chosen, as in the 1840s contract document. The building at Smeafield was one of the smaller ones designed by Benjamin Green for the N&B. It was located on the down side of the tracks, immediately north-west of the level crossing. The two-storey section was L-shape, and like the other buildings on the route, of sandstone ashlar with a Welsh slate roof. Other familiar N&B features were a canted bay facing the railway, raised gables, ball finials and prominent chimneystacks. At the south-eastern end the roof sloped down over a small single-storey section. The building cost £506, being in the same price bracket (£450-520) as cottages at Forest Hall (then called Benton), Plessey, and Goswick (then called Wind Mill Hill) and the stationmaster’s house at Lesbury, all of which had architectural similarities. Lesbury was intended as a short-term railhead for Alnwick, but the similar designs at Smeafield and the other three listed here, each of which became passenger stations, suggests that the intention was to make them stations eventually. Fawcett (in Addyman [ed] 2011) speculates that because these buildings were much larger than the standard crossing-keeper’s cottage on the Newcastle and Berwick line they might have been intended to handle goods traffic from the outset before passenger trains began to call. No station is indicated at Elwick Gate on the 1865 OS map, but Smeafield is shown as a calling point for passenger trains in the NER working timetable of February 1871. Hoole (1985) notes that Smeafield was originally a private station, and although this description would normally be applied to one serving an influential landowner, a factory, a mine or an institution, there was presumably no intention at first to make its presence known. Its covert existence was exposed when in January 1875 Smeafield first appeared in Bradshaw. Smeafield station was provided with two facing platforms north-west of the level crossing. The existing crossing cottage became the station house, on the down platform, but map evidence suggests that the up platform did not have any buildings. A ground cabin, on the down side, was replaced by the North Eastern Railway with a stone N1 design signal box also on the down side, south-east of the level crossing; it had opened by October 1877. A 10-lever Stevens frame was installed. Among N&B stations Smeafield was unusual in that it possessed neither a coal depot nor goods facilities. Station appears only as a footnote. Precise calling times are not stated. In 1911 the station, serving a population estimated at 35, issued only 369 tickets – the least of any of the N&B line public stations. Newham came closest to this figure (2,453) followed by Scremerston and Goswick, all of these being in the northern section of the route. Fallodon (private) booked only 18 passengers three years later in 1914. The 1912 timetable (below) shows an additional late evening northbound call by request on Tuesday and Saturday only. This presumably enabled the passengers returning from Alnwick market on Saturday to enjoy a drink before heading home to their rural seclusion. By August 1927 Smeafield’s service was limited to Tuesday and Saturday, the Monday call having been discontinued. However Quick (2009) notes that the July 1928 and July 1929 timetable shows one daily weekday call in each direction; at last, it seems, Smeafield’s residents were allowed to travel on a Thursday or Friday! This luxury was to be short-lived as the little-used station disappeared from the public timetable at the end of 1929. This was possibly not the end of the story as Croughton et al (1982) suggest that Smeafield station continued, for an unspecified period, to be used by passengers. A local resident, in conversation with the author in 2001, recalled a relative using the station to make shopping or market journeys in the late 1930s or 1940s; the survival of the station’s platforms until at least 1958 gives some support to this recollection. It is not known when the platforms were demolished, but they are no longer shown on the 1: 2,500 OS map of 1967. 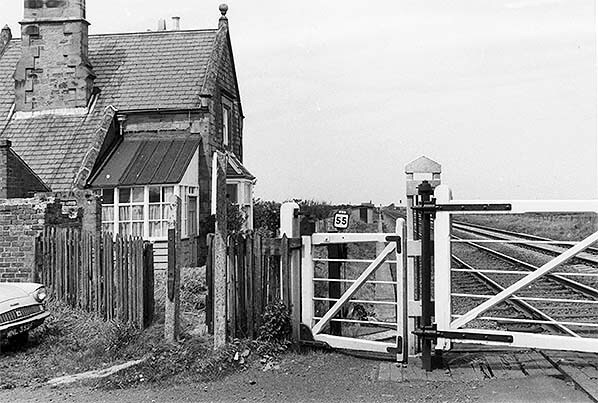 The signal box closed on 9 December 1973 - presumably coinciding with the replacement of the gates with barriers – and was later demolished. 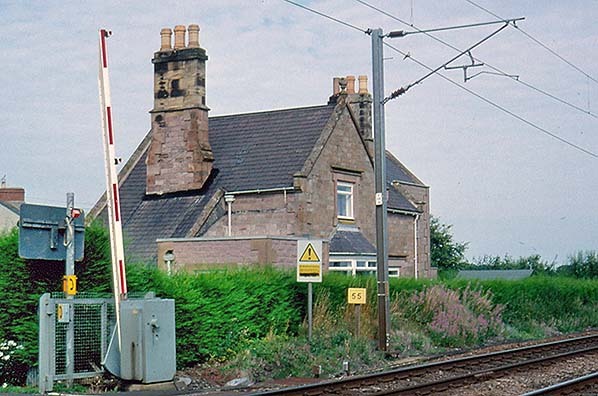 Thereafter the crossing was controlled with CCTV surveillance by Belford box, then from Tweedmouth when Belford box closed on 8 July 1990. 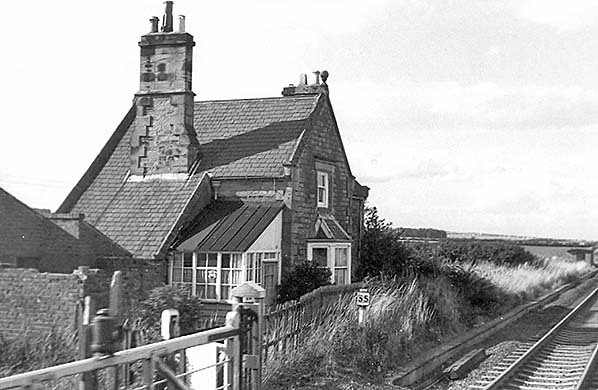 Whilst the highly impressive building at Beal, the next station on the way to Berwick, has long been demolished, its humbler neighbour at the obscure Smeafield station is still in residential use. Smeafield station, looking south-east in 1958. The station house, originally accommodation for the crossing keeper, is a Newcastle & Berwick Railway design, constructed with the line in 1847. The station was handling passenger traffic by early 1871 but did not appear in public timetables until January 1875. For most of its life it was served only on two or three days per week for journeys to and from market and handled very few passengers. After trains ceased to make advertised calls at the end of 1929 it is understood to have remained in use for some time, and this might be the reason for the survival of the platforms 30 years later. What appears to be a Gresley V2 is hauling a down goods past the signal box. 1898 1: 2,500 OS map. The station is marked and named, with its platforms shown indistinctly to the north-west of the level crossing. No building is shown on the up platform. A signal box can be seen immediately south-east of the crossing, on the down side of the line. Unusually for Newcastle & Berwick stations there are no sidings; no goods or coal traffic was handled. Two railway cottages have been added a short distance west of the station. 1924 1: 2,500 OS map. Nothing of significance has changed in quarter of a century. The platforms are shown more clearly than in the previous edition of the map. Looking south-east from Smeafield station over the level crossing towards the signal box in 1960. The box was constructed by the North Eastern Railway in the 1870s and is an N1 design. Class A1 No.60159 ‘Bonnie Dundee’ is heading a northbound express. The Peppercorn-designed 4-6-4 loco was built at BR Doncaster works in November 1949. She was withdrawn from 64A, St Margarets shed, on 14 October 1963 and cut up at BR Inverurie works in January 1964. 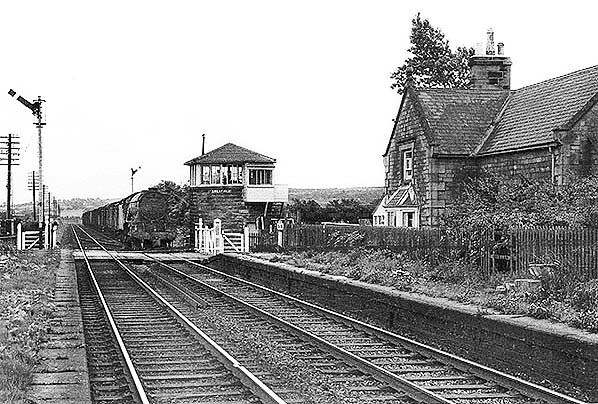 Smeafield station, looking north from the level crossing c1971. The former station house is in residential use. The platforms have been demolished. Smeafield station house is seen from a southbound train on 7 September 1972. By this time the adjacent down platform and its opposite number had been demolished. 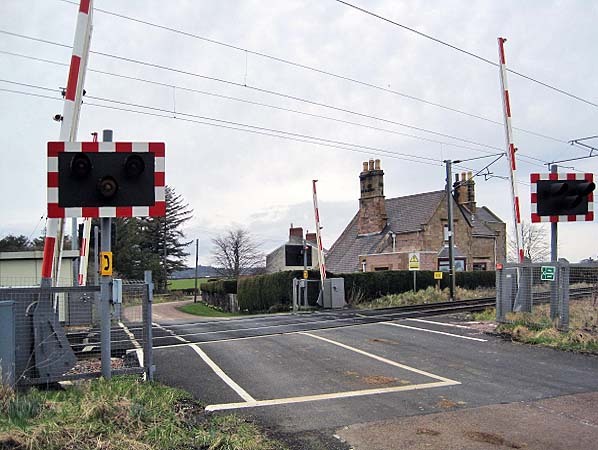 The traditional crossing gates are still in place, but would soon be replaced with barriers. Smeafield station house looking west from the level crossing in August 2001. 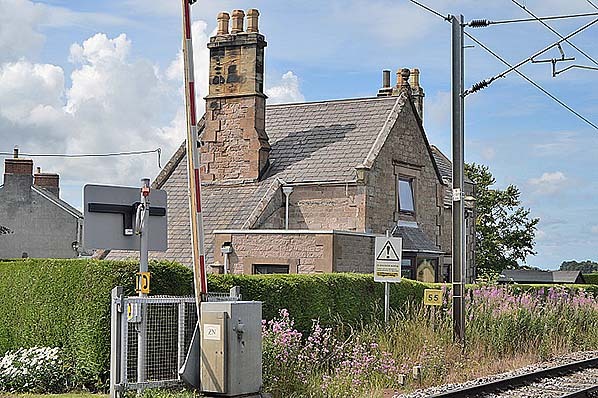 Since the earlier photos the timber and glass lean-to porch has been removed and a stone entrance built in its place; the crossing gates have been replaced with barriers; and the line has been electrified. The ‘55’ milepost gives the distance from Newcastle Central station. 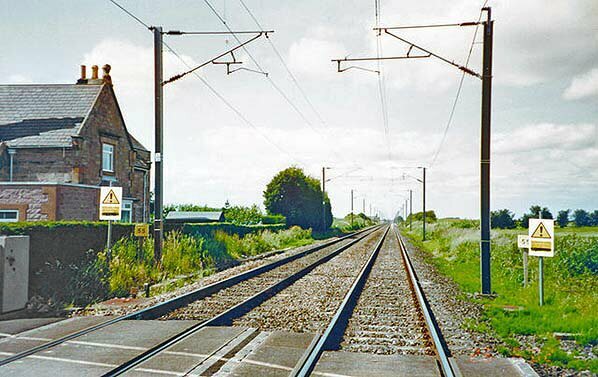 Looking north-west from the level crossing towards the station house at Smeafield and the site of the platforms in June 2002. Smeafield station house, looking west over the level crossing in March 2010. Railway cottages can be seen in the background. 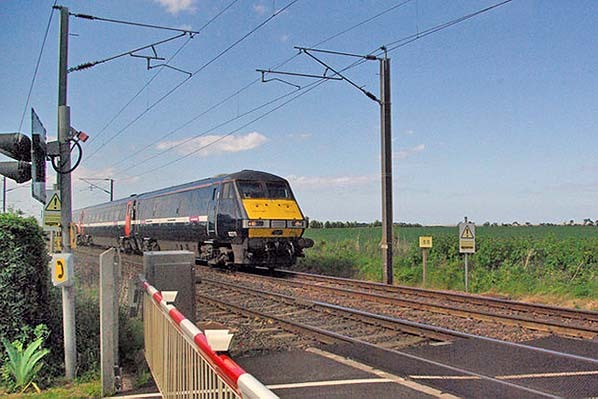 In June 2010 a Class 91 is travelling northwards past the site of Smeafield station. The station house is out of sight to the left. Looking north from the level crossing at Smeafield in July 2015. The station platforms either side of the railway were demolished between 1958 and 1967. Looking north-west over the level crossing towards the site of Smeafield station in July 2015. The station house, originally a cottage for the crossing keeper, is the only remaining structure, and it remains in residential use. The two platforms have been removed without trace. Smeafield station house looking west from the level crossing in July 2015. The gable end on the left belongs to the railway cottages – the station’s only near neighbours. The roof of Smeafield station house, looking north-west from the level crossing in July 2015. 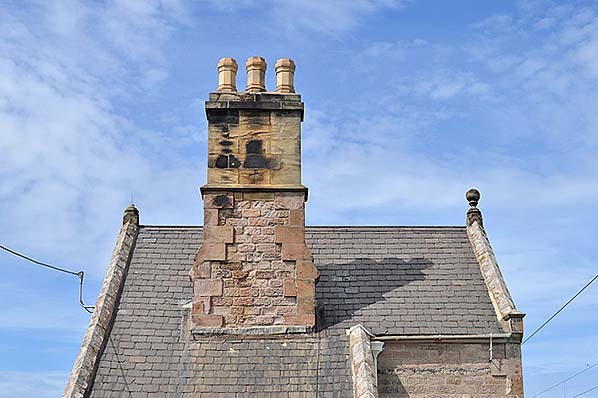 Welsh slate roofs and prominent chimneystacks were a feature of the Newcastle & Berwick Railway buildings. The stack is given an appearance of greater solidity by the smooth stone quoins. The raking parapets, or raised gables, are another common N&B feature as are the kneelers (stone projections at the gable end) and decorative ball finials on the summit of the gable; in this case one of the finials is missing.